Every year I try to find something that pushes me further or at least gets me out of my comfort zone for a bit. This year I finally convinced/found a friend who would bike the Pittsburgh-D.C. 334 mile Rail Trail! I've been intrigued by the idea for the past 3 years or ever since I got back from my European adventures. However, life, work, and not wanting to do the trek alone delayed it until now. Day 1: Rain. It was a constant drizzle for about 5 hours of the day's 6 hour trip. 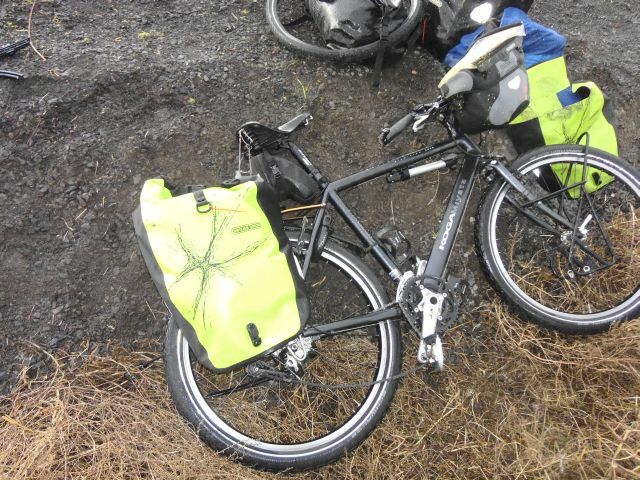 We dragged our bikes and packs around three fallen trees and pulled into our camp in Connellsville with dirt caked to our tires and pretty much soaked to the bone. But what's an adventure without a good story. Sam Tinianow, lead station technician for CoGo Bike Share, repairs a docking unit at the system’s City Hall station. CoGo has 30 stations and plans to add eight to 12 outside the Downtown area in the next year. CoGo Bike Share patrons have taken more than 60,000 trips since the service launched last summer. The service is expanding outside Downtown and landed a sponsorship from Medical Mutual this summer to help pay for operations. City officials and CoGo representatives say they’re pleased with the bike share’s first year. However, CoGo has suffered from some of the same problems that have hit other U.S. bike-share systems, including falling short of ridership projections. PORTLAND, Oregon—It's an early-summer morning at the construction site for Portland's first new bridge in a generation, the Tilikum Crossing, and Dan Blocher is feeling good about its progress. Completion is still a year away, but since the two ends of the bridge were connected in the middle several weeks ago, public response in self-described Bridgetown (when it's not, say, the Rose City, Stumptown or Rip City) has been positive. "Most people can sort of viscerally recognize an inherent beauty when the bridge is properly designed for its need," says Blocher, executive director of capitol projects for TriMet, the city's transit agency. "I think you know when you've got it right when the completed product just seems to fit, just like it belongs there. And we feel very good about the feedback we're getting on this bridge now that you can see what it's going to look like." Online registration ends August 29th at NOON. Register today. No rain date, ride will take place rain or shine! Bike the C-Bus is celebrating our SEVENTH year! The ride is a fun way to check out a few of the neighborhoods in and around Columbus. Experience segments of the King Lincoln District, Woodland Park, Olde Town East, Downtown, Short North Arts District, Italian Village, Harrison West, Victorian Village, Arena District, Franklinton, Brewery District and German Village. The entire ride will cover approximately 25-30 miles over 4 segments and will feature stops that highlight change that is occurring in our neighborhoods. Each stop will be sponsored by businesses and community groups and provide snacks, drinks and entertainment for the riders. The ride is configured to allow cyclists to complete segments if they do not feel comfortable riding the entire route. The $35 registration fee includes an official 2014 Bike the C-Bus t-shirt (if you register by August 15th) along with drinks and food at designated rest stops, plus a free lunch. Online registration ends at NOON on Friday, August 29, 2014. On-site registration on Friday evening and Saturday morning will increase to $40. A portion of the proceeds are donated to local charities, click here to see our 2013 non-profit partners. IMPORTANT: Are you a current Yay Bikes! member? Before you register, email kathleen@yaybikes.com for your $25 registration code! Not a Yay Bikes! member? Join today and get the code before you register. We are unable to provide refunds, but you may transfer your registration to another participant if you are unable to attend. You will receive a receipt and further information via e-mail. The aftermath of a collision in eastern Oregon. There have been four (officially recorded) rear-end collisions involving a bicycle rider in the past week. One of them resulted in a fatality and the other three resulted in serious injuries. The incidents have occurred throughout Oregon and nearby southwest Washington. What's an Emmy nominee to do about downtown traffic on awards night Monday? Well, one could limo-pool, depart at 2:30 p.m., or use the valet at a nearby hotel — or hail an Uber or brave freeway gridlock like an average commuter. Then there's Tom Smuts' way: bike it. The writer, who is nominated for Outstanding Drama Series with the rest of the producers of Mad Men's seventh season, will lead a 15-person bike ride to the awards ceremony. The Television Academy has granted permission for six riders to cycle up to the carpet, a group that will include Smuts' wife,Homeland executive producer and two-time Emmy winner Meredith Stiehm. The route will run 17 miles from their Santa Monica home to the Nokia Theater in about an hour and a half, Smuts says, and forget the spandex — he will arrive in bike-friendly evening attire (pictured) by Rapha. The end is in sight. On Tues., Aug. 26, a groundbreaking ceremony will mark the final phase of the ALUM CREEK TRAIL. 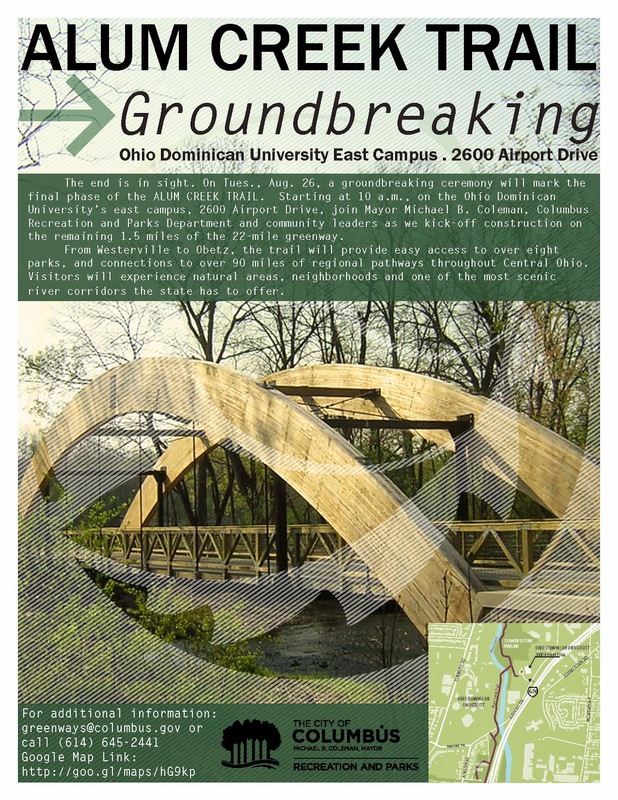 Starting at 10 a.m., on the Ohio Dominican University’s east campus, 2600 Airport Drive, join Mayor Michael B. Coleman, Columbus Recreation and Parks Department and community leaders as we kick-off construction on the remaining 1.5 miles of the 22-mile greenway. From Westerville to Obetz, the trail will provide easy access to over eight parks, and connections to over 90 miles of regional pathways throughout Central Ohio. Visitors will experience natural areas, neighborhoods and one of the most scenic river corridors the state has to offer. Chris Haydocy says plans for a Wilson Road hub on the Cleveland-Cincinnati bike trail will help revitalize the West Side.